29 Aug What Makes a Modern Kitchen? can be a challenge to determine what sets it apart from the Contemporary style. The two are in fact, similar yet profoundly different. When one is speaking of up-to-the-moment as in right now, they are referring to the Contemporary style. Modern, on the other hand, is of a specific design scheme from the early to mid-20th century that actually broke off from the standard styles of the days before the Industrial Revolution, creating a look all its own. You need to be careful when using the term “Modern” because it can also be used to describe something that is the antithesis of Traditional. The issue being that Traditional styles vary per individual time period. For instance, the transition from slicked back hair to the wild and long mops of the hippies in the sixties was “modern” at the time, but quite dated today. 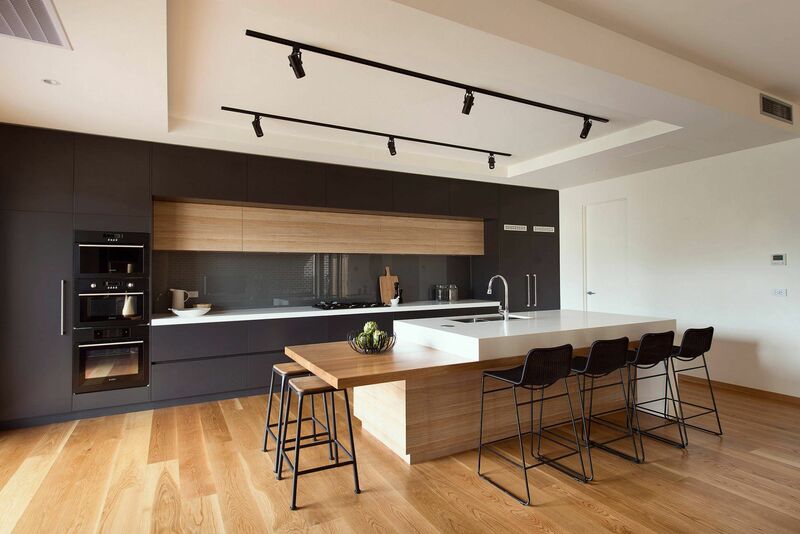 Modern kitchen designs are sleek and simple with strong lines, practically no decorative elements, with the natural appeal of the materials showcased. The following information details the most important traits of the modern kitchen, and why they’ve remained relevant for so long. Sometimes referred to as a “slab-door style” the flat-panel door style is a unique cabinet trait long inherent to the modern and European kitchen cabinets design. If you happen to notice a Shaker (paneled) door style in an otherwise modern kitchen, it automatically becomes a “Transitional” room, another style type that blends elements of both Modern and Traditional, but is not purely one or the other. Another favorite trait of a Modern kitchen is – get ready for it – frameless full-overlay cabinet construction (it’s also referred to as “euro frameless”). It is a cabinet style in which the door overlays the cabinet box. It’s generally considered to be of the Modern motif because it is sleeker than a cabinet with a flush inset that is associated more with Traditional kitchens, cabinets and furniture design. You won’t even see a face frame in a frameless cabinet but there is consistent spacing between all the doors and drawers, even between the two cabinets. The framed overlay, meanwhile, maintains a face frame with varying space between doors and cabinets. 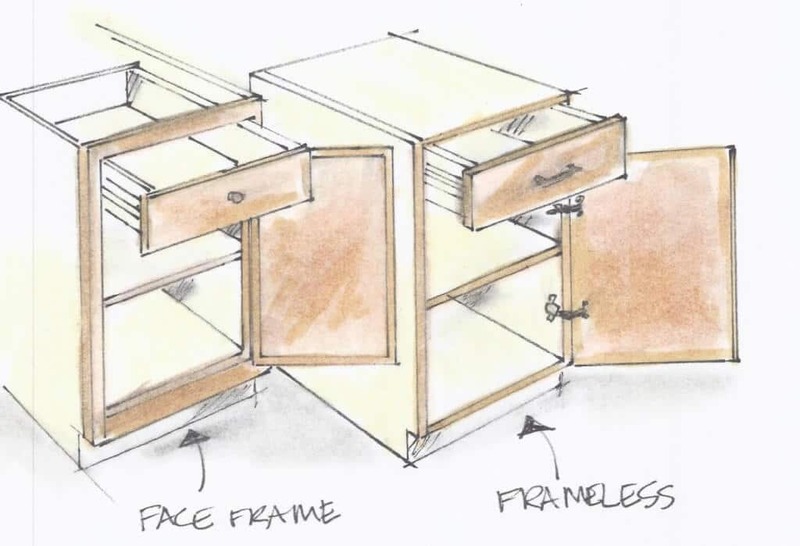 You can’t see the frame at all (except for a thin line between doors) when the doors are closed on a “frameless” cabinet. Simple, sleek hardware is used to finish modern kitchen furniture. You will likely find C-channel hardware and tubular or flat linear pulls integrated into the cabinet. Expect to see the horizontal cabinet lines accompanied by cabinet hardware that runs the entire length of the doors and drawers. Another long time (non) feature of modern is the absence of ornamentation. This is also the area where contemporary and modern kitchens start to differ. In a contemporary kitchen you can be overwhelmed by the wild assortment of patterns, colors and textures. A modern kitchen, however, is in fact no frills in comparison. Simple flat panel doors are accompanied by plain backsplashes that feature no added décor. In the absence of such molded or printed flare, it’s the beauty of natural materials that the modern design counts on for embellishment. The characteristics of those materials such as varying wood grains or veining found in marble countertops are enough to make a powerful statement. It’s not a focal point necessarily, but the Modern kitchen has a tendency to be based on the horizontal; long wide lines and stacks of drawers lined in a row, with long and horizontal hardware set to accentuate those drawer lines. Once it’s been pointed out, you will never look at a Modern kitchen the same again. Accent piece style consistency is another aspect found in the Modern kitchen. 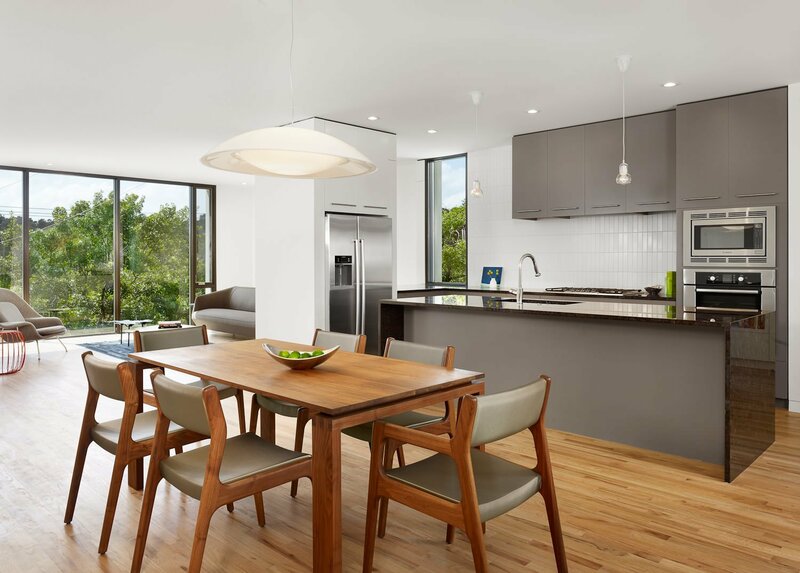 Tables, chairs, bar stools, and lighting are all accents that remain similar in their simplicity (although the barstools will be sleek and pendant lights are typical); unlike in a contemporary setting where anything goes. Despite its tendency for simplicity, color may be disbursed in a Modern kitchen, possibly in the accents or the cabinets. Of course, Industrial elements are all the rage these days, their plain and somewhat cold nature seems instantly Modern somehow. 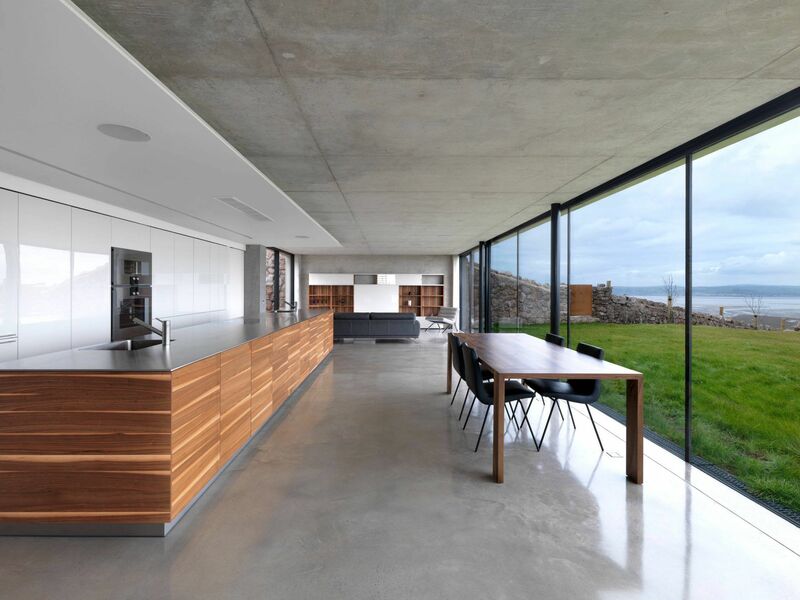 Untreated concrete walls, pale countertops and brushed steel make for just another reasonable representation of the Modern style, though not long associated with it. 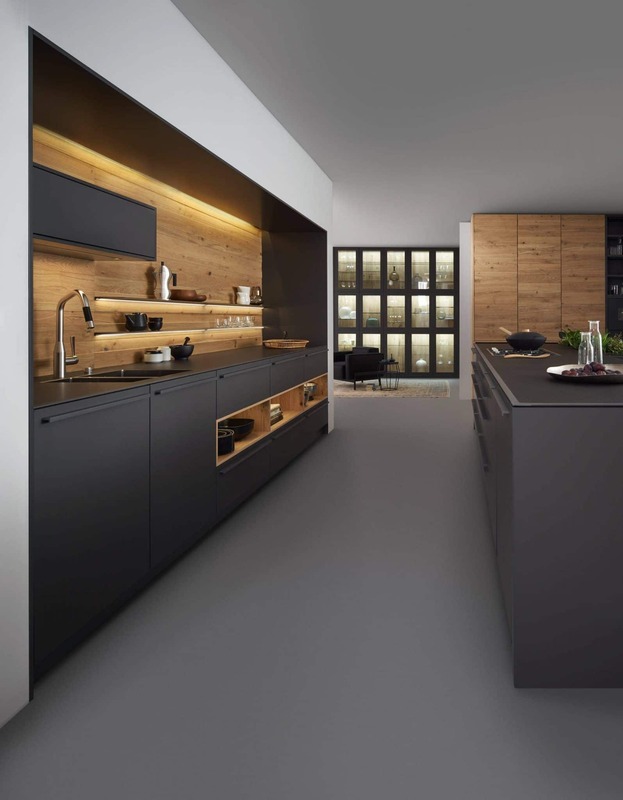 So there you have it, elements of euro style cabinets, sparse ornamentation, sleek hardware and the natural beauty of materials all work together to create a cohesive theme, a wildly popular and potentially timeless design known as the Modern kitchen.